A last minute drop-goal by Jamie Ellis sealed a thrilling come from behind victory for Castleford Tigers against Wigan Warriors in the rearranged game at the Mend-A-Hose Jungle. Daryl Powell’s men were trailing 12-4 at half-time and had to play almost all the last 10 minutes with 12 men, but came through to win 19-18 after an heroic effort from a team with 12 first team players absent. In a frantic finish Ellis proved successful with his second field goal effort while Josh Woods and Sam Tomkins were both unsuccessful with drop attempts at the other end. It was justice as far as the home fans were concerned after typically controversial refereeing from James Child that saw big decisions go Wigan’s way, with the eventual win taking Cas up to third in the Betfred Super League. A competitive first half saw Wigan initially forcing the pressure without being able to get over the line as Josh Woods and Ben Flower were held up over the line and Sam Tomkins superbly wrapped up by James Clare close to the whitewash. On the Tigers’ first serious attack Jamie Ellis was tackled just short and the set ended with a left edge move that saw winger Jy Hitchcox drop the ball on the flank following Michael Shenton’s pass with the line looking open. Hitchcox was then controversially penalised by referee James Child for moving off the mark 30 metres from his own line. Wigan chose to run the ball and were rewarded when Tomkins managed to get free and wriggled his way over the line for the opening try. Cas needed some good defence to keep the Warriors out as Grant Millington’s tackle on the line denied Tommy Leuluai. But they were back on the attack on 26 minutes to put their first points on the board as Quentin Laulu-Togaga’e collected a smart pass from Jake Trueman to cross for a try that went unconverted by Ellis. Wigan went back in front thanks to a piece of individual brilliance from speedy winger Liam Marshall who raced past several tacklers on a run from his own half and rounded Laulu-Togaga’e for a fine try. Tomkins added the conversion and landed a penalty three minutes before half-time to make the interval score 12-4. The possible turning point came early in the second half when Hitchcox was taken out in the air by Willie Isa. 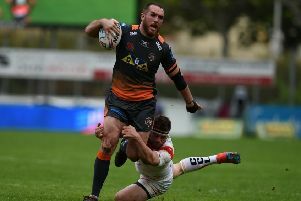 A penalty followed, but the Warriors player was put on report instead of being sin-binned and the Tigers winger was taken off injured, not to return. The home fans increased their backing and volume and the players responded with a real purple patch. They were right back in the game when Shenton raced through a gap after taking Paul McShane’s pass. Ellis converted then kicked a penalty to even the scores at 12-12. An unbelievable missed chance looked like it could prove important when James Green inexplicably failed to race over the line when clear and saw his pass to Junior Moors dropped. This had come after Clare had made a great break from his own half to bring good field position. The pressure continued, though, as McShane’s kick forced a drop-out and Matt Cook then burst powerfully onto a pass to score a great try. Ellis’s kick made it 18-12. Another turning point saw more controversial refereeing as Cook went from hero to villain when sin-binned for an alleged crusher tackle, leaving the hosts with 12 men for almost all the remainder. Straight away Wigan took advantage of their extra man with a swift break and great finish by winger Tom Davies. The conversion from Tomkins levelled the game again and the Warriors were now favourites. But the Tigers dug in and came up with their big finish to take the points. Ellis was the ultimate hero, but it was hats off also to McShane for charging down Tomkins’ attempted drop-goal. That summed up just how determined Cas were to win the match against their old rivals. Scorers - Castleford: Tries Laulu-Togaga’e, Shenton, Cook; goals Ellis 3; drop-goal Ellis. Wigan: Tries Tomkins, Marshall, Davies; goals Tomkins 3. Castleford Tigers: Laulu-Togaga’e; Clare, Webster, Shenton, Hitchcox; Ellis, Trueman; Cook, McShane, Massey, Moors, Millington, Maher. Subs: Springer, Green, Clark, Egodo. Wigan Warriors: Tomkins; Davies, Sarginson, Gildart, Marshall; Woods, Powell; Navarrete, Leuluai, Flower, Paisley, Isa, Hamlin. Subs: Escare, Field, Clubb, Tautai.